In the first of a series of papers, we assembled a developmental series of 135 kidney specimens spanning the earliest stages to midgestation, creating a publicly available histologic reference resource (www.gudmap.org). Macroanatomic and micro-niche architecture was dissected through a variety of molecular and cellular approaches. This resource will serve as a bridge to legacy data making human kidney development accessible to a modern research and clinical audience. 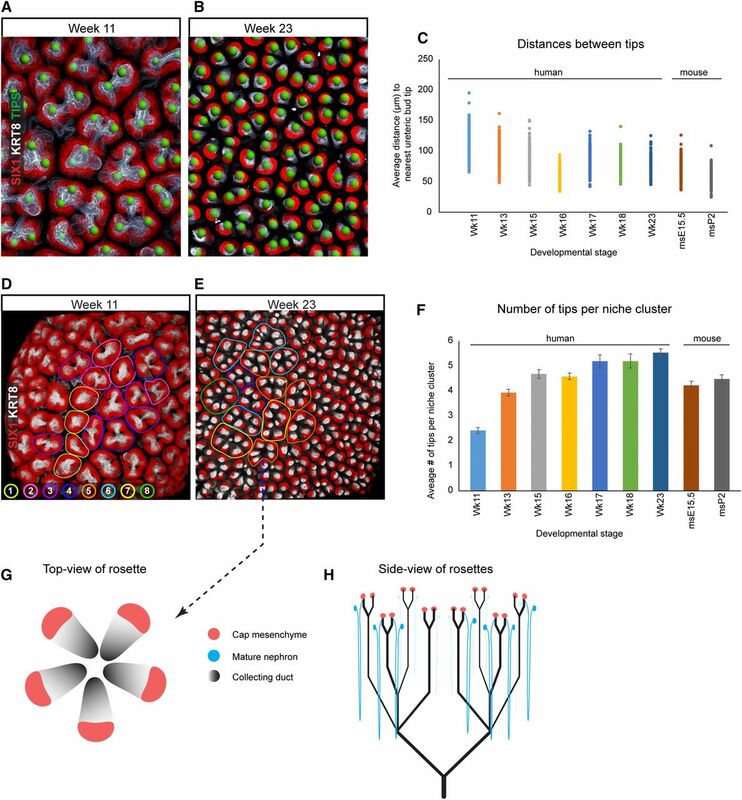 Subsequent papers will provide an in-depth analysis of the mesenchymal progenitor populations, induction and patterning of the early nephron, and morphogenesis of the collecting duct system. Our study was on the basis of 135 consented, anonymous, donated kidney specimens spanning 4–23 weeks of human kidney development. Figure 1 provides a detailed chart of the number and developmental distribution of the kidney samples and the various analyses performed at different developmental time windows. Summary of samples used in the study. Graphed data for specimens used for H&E, SISH, IHC, whole-mount (WM), and RNA-seq. H&E, Hematoxylin and eosin; IHC, Immunohistochemistry; SISH, Section in situ hybridization; RNA-seq, RNA-sequencing. Outgrowth of the ureteric bud from the nephric duct into the adjacent metanephric mesenchyme initiates active metanephric kidney development. The interactions between epithelial tip and kidney progenitor types within the metanephric mesenchyme drive assembly of the mammalian kidney.1–3,40 Our focus herein lies in providing an overview of human kidney organogenesis: organizational changes within the branching collecting duct network, capping mesenchymal populations, and nephrogenic program. Detailed molecular and cellular analyses of each of these events will be discussed separately. In the mouse, outgrowth of the ureteric bud into an adjacent prespecified population of metanephric mesenchymal progenitors, the initiating event in kidney morphogenesis, commences at E11 (Supplemental Figure 1A). Potter23 reported human metanephric kidney development beginning at CS13, approximately 4 weeks postfertilization (embryo crown-to-rump length of 5 mm). Consistent with this view, a single nondivided, bulbous-shaped ureteric bud outgrowth surrounded by metanephric mesenchyme was observed in the CS13 embryo (Figures 2A). By CS16, the bud generated one to two branches with cap mesenchyme cells tightly clustered around each branch tip (Figures 2B and 5A), resembling the E12.5 mouse kidney (Supplemental Figure 1B). In contrast to the mouse, the branching human ureteric epithelium was bilayered from CS13 to CS16 (Figures 2, A and B, and 5A). By CS19, ureteric branch tips where unilaminar and physically distinct mesenchymal cell populations that likely harbor the nephron progenitors, cap each branch tip (Figures 2C and 5B), a persistent arrangement maintained to 23 weeks, the latest stage studied (Figures 2, 3, 5 and 7). During the CS16–CS22 period, branch tips adopt a “T” or “Y” shape (Figure 2, B–D). The ureteric branch tip morphology changed at around CS23 when tips showed a pronounced expanded morphology with a prominent lumen (Figures 2E, 4, A and F, and 5D). This tip reorganization persisted to week 9 (not shown) but was not observed beyond week 10 (Figure 3, A and B). After CS23, tips maintained a “V”-shaped morphology to week 16 (Figure 3, A–D). Histologic analyses of human kidney development show emerging complexity in the human kidney. (A–E) Hematoxylin and eosin staining of human kidneys from CS13 to CS23. Scale bars as indicated on fields. Black arrowheads point to cell striations, red arrowheads point to surface indentations. Boxed areas shown in Figure 5. CD, collecting duct; CM, cap mesenchyme; DT, distal tubule; RC, renal corpuscle; UB, Ureteric bud epithelium; UBT, ureteric bud tip. Histologic analyses of human kidney development show emerging complexity in the human kidney. (A–D) Hematoxylin and eosin staining of human kidneys from week 10 to week 16. Scale bars as indicated on fields. Red arrowheads point to surface indentations, green arrowheads point to lobe folds. Immunofluorescent characterization of early human kidney development and lobulation show conserved and divergent features. (A–C) Sagittal sections of a week 8 (CS23) and week 15 kidney with immunofluorescent labeling for SIX2, KRT8/18, and PHH3 (insert shows high magnification of week 8 tip and nephron progenitors; scale bar, 20 µm). (B and C) Peripheral and interlobular regions of week 15 cortex, respectively. Inserts show high magnification of tips with surrounding nephron progenitors. Scale bars in inserts are 20 µm and inserts show SIX2, KRT8, and DAPI stain. Arrowheads in inserts point to polarized progenitor cells. Equivalent stains for mouse E15.5 and P2 are shown in (D and E). (F–H) Sagittal section of a week 8 (CS23) and week 15 kidney with staining for WT1, JAG1, and CDH1. (G and H) Peripheral and interlobular regions of week 15 kidney cortex, respectively. (I and J) Equivalent stains for mouse E15.5 and P2 stages. White arrowheads point to lobe folds, open arrows point to multilayered cap mesenchyme, and yellow arrowheads point to polarized progenitors around tips. White dashed lines demark where lobes meet. 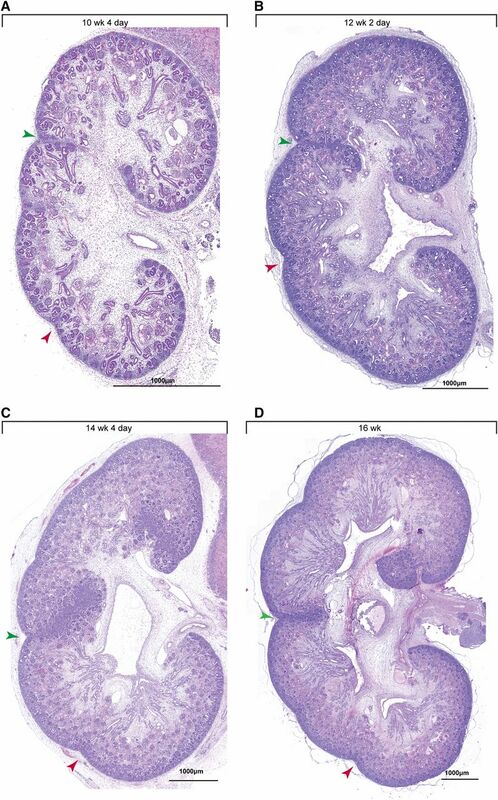 Histologic analyses of human kidney development show nephron formation and maturation. (A–H) Hematoxylin and eosin staining of human kidneys from CS16 to week 16 kidney as specified on fields. Magnified fields from Figure 2 have been rotated so top and bottom reflect the cortico-medullary axis. Scale bars as indicated on fields. CM, cap mesenchyme; DT, distal tubule; RC, renal corpuscle; UBT, ureteric bud tip. 3D whole-mount analyses of early human kidney development display the formation of the collecting duct system and nephrons. (A–F) Immunofluorescently labeled whole human kidneys at CS20, CS22, CS23, and week 11 stained for JAG1 to mark nascent nephrons and KRT8 to highlight the ureteric bud. The week 11 sample also stained for WT1 to mark glomeruli. Nephron counts performed using the JAG1 stains and highlighted using spheres. Nephron counts and scale bars as indicated on fields. a.b., anterior domain branch, indicated with dashed lines and arrowheads; i.b., interdomain branch; p.b., posterior domain branch. Three-dimensional characterization of the human nephrogenic compartment shows gradual reduction in progenitor endowment. (A–F) Whole-mount immunofluorescent stains for SIX1 and KRT8 in week 11 to week 23 kidneys. Images display a view from the top of the nephrogenic compartment looking downward toward the center of the kidney, a single confocal section, and the side-view of the niche. Single slices also display PHH3 stain. (G) Quantitative analysis of the number of nephron progenitor cells per ureteric bud tip. (H) Quantitative analysis of PHH3+ cells in the SIX1 + cell population. ms, mouse. Unlike the mouse, the human kidney is comprised of multiple lobes.19,23 The region between lobes has previously been suggested to form the “column of Bertin,” but Potter argues that a better term might be “sheets of Bertin” because they are the surfaces of two nephrogenic zones.23 Because these regions are simply the meeting point of two peripheral curvatures of kidney cortex, we refer to these as interlobular folds or interlobular regions. Lobulation is first detected at CS19 with the appearance of striations between anterior and posterior kidney domains (Figure 2C). The stromal striations described here contrast with the view of Potter.23 The cortical surfaces of the kidney indent from CS20–CS23 (Figure 2, D and E), and visible lobes become morphologically pronounced as additional lobe folds appear from 10 to 16 weeks (Figure 3). To further examine the nephrogenic niches at peripheral and interlobular regions, we performed an immunofluorescent analysis to detect cell types characteristic of the mouse nephrogenic niche. The earliest samples compatible with immunodetection were CS23 kidneys. At this time, a dense population of SIX2+ nephron progenitor cells surrounded the ureteric epithelial tips (Figure 4A), similar to the organization documented in the week 16 human kidney.28 This progenitor population was 2–7 cell-layers thick (arrowheads in Figure 4A), the thicker portions located to the sides of the ureteric epithelial branch tips. The cells closest to the tip were polarized, with their long axis approximately perpendicular to the tip, whereas other SIX2+ putative progenitors where rounded without an elongated nucleus. 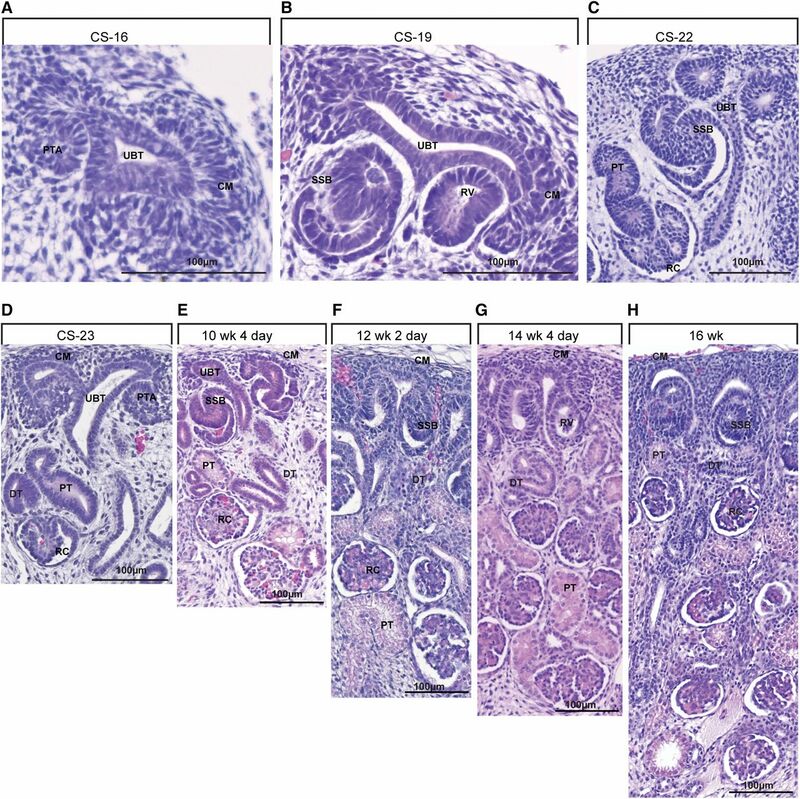 At 15 weeks, 2–3 layers of SIX2+nephron progenitors were tightly packed around each ureteric epithelial tip (Figure 4, B and C, Supplemental Figure 2A). SIX2+ cells show a specific organization, with long axes of cells closest to the ureteric epithelial tip orientated at right angles to branch tips (Figure 4, B and C). Peripheral and interlobular regions displayed a similar morphology (Figure 4, B and C). The architecture of the E15.5 mouse nephrogenic niche resembled that of CS23 and week 15 human kidneys, although smaller in size with fewer SIX2+ cells (Figure 4D). The P2 mouse nephrogenic niche was distinctly different from human stages examined here; the few SIX2+ cells around the tips morphologically resembled pretubular aggregates (PTAs) and renal vesicles (RVs), early committed stages in the nephrogenic program (Figure 4E; see later discussion of human nephrogenesis). In the mouse, MEIS1+/FOXD1+ cells demarcate the interstitial progenitor pool that lies above the SIX2+ nephron progenitors beneath the kidney capsule (Supplemental Figure 2C7,41). A similarly positioned SIX2−; MEIS1+ population of putative interstitial progenitors was observed in the human kidney, with SIX2−; MEIS1+ cells separating adjacent SIX2+ nephron progenitor niches in interlobular regions (Supplemental Figure 2, D and E). To broadly examine active nephrogenesis we visualized JAG1, a marker for nascent nephrons,42 and WT1, a marker of interstitial and nephron progenitor cell types that in the mouse shows polarized activity in early RVs prefiguring a role in podocyte development (Figure 4, I and J). We observed a continuous active program of nephrogenesis across interlobular (15 weeks) and peripheral regions (CS23 and 15 weeks) of human kidneys (Figure 4, F–H, Supplemental Figure 2B). In conclusion, the similarities in cell morphology, cell types, and cell organization suggest peripheral and interlobular mesenchymal niches follow similar programs in the human kidney. Further, clear parallels are evident in the organization of nephrogenic niches between mouse and man. The emergence of different structures and anatomic features during the first nephrogenic events are summarized in Table 1. Evidence of human nephrogenesis was first observed at CS16 (Figure 5A), with PTAs beneath the ureteric branch tips resembling those of the E12.0 mouse kidney (data not shown). By CS19, PTAs, comma-shaped bodies, and SSBs were observed beneath the ureteric branch tips (Figure 5B). The connection of the nephron to the ureteric epithelium was evident by the SSB stage. At CS19 it was possible to find a maximum of two generations of developing nephrons per tip; e.g., a PTA and an SSB. Capillary loop–stage nephrons were first detected at CS22, by which time three generations of nephrons were observed; e.g., a PTA, an SSB, and a capillary loop nephron (Figure 5C). Capillary loop–stage nephrons at CS23 were extensively vascularized, indicative of a mature glomerular organization, but showed a rudimentary associated tubular network (Figure 5D). Subsequent developmental time-points exhibited further nephron generations and maturation of the renal corpuscles (Figure 5, E–H). On the basis of the first appearance of a structure, progression from the first PTA to a connected SSB takes between 3 and 14 days: the shortest and longest time intervals between CS16 and CS18 stages, and a further 1–10 days to a capillary loop–stage nephron. With a midpoint time-frame estimate, progression from a PTA to an SSB stage would take around 8 days, with a further 5 days of development to the capillary loop stage. In contrast, in the mouse there are no nephrons at E11.5 (Supplemental Figure 1A) and clear SSB stages by E12.5 (Supplemental Figure 1B), consistent with time-lapse imaging of developing kidney44,45 indicating a time-span of around 24 hours from induction to SSB formation. To better characterize the development of the first generation of nephrons, we performed whole-mount analysis of complete kidneys for JAG1 and KRT8 to visualize early nephrons (RV to SSB stages) and the ureteric epithelium, respectively, in whole kidney tile scan reconstructions from CS20 to week 11. At CS20, three branching events of the ureteric bud have generated anterior and posterior subdivisions (first branching event), and subsequent bifurcation divisions (Figure 6A). Scoring individual JAG1+ structures indicated that the kidney contained 111 developing nephrons spanning RV to SSB stages. A second CS20 sample (Figure 6B) exhibited morphologically thinner and more elongated epithelial branch tips, although the endowment (114) and maturation of nephrons closely matched. By CS22 (Figure 6C), the ureteric bud elongated further and the kidney contained 170 nephrons ranging from RV to SSB stages. By CS23, ureteric branch tips swelled, consistent with the histologic data discussed earlier (Figure 6D). Initiation of renal pelvis development was evident, with the early branches visible but partially engulfed within the pelvis, pointing to ongoing remodeling of the collecting duct epithelium. By week 11, an additional expansion of the pelvic region was observed (Figure 6E) and >1000 nascent nephrons could be visualized (Figure 6F); more mature nephrons evident in histologic evidence were not detected with this procedure. Video images of the whole-mount data can be viewed in the Supplemental Material. These five samples all displayed a ureteric bud division along the anterior-posterior axis of the kidney. All specimens also displayed a single major interdomain branch projecting in a dorsal direction. Although the interdomain branch is consistently closer to the posterior domain branch point, it did not appear to project from this branch, raising the possibility that the initial division of the ureteric bud is a trifurcation in the human; trifurcations are also commonly observed in the first branching of the T-stage ureteric outgrowth in the mouse kidney46,47 and have been speculated to occur in humans,19 although this branch could also have emerged from the posterior domain branch, immediately after an initial bifurcation. Studies in the mouse kidney have quantified cell types and cell organization in the nephrogenic niche over the period of nephrogenesis.34 Over the initial period of branching, there is a reduction of nephron progenitors per ureteric epithelial branch tip, followed by a lengthy period where progenitor numbers remain approximately constant per branch tip until birth, with the cessation of branching and an accelerated commitment of progenitors to nephrogenesis. To resolve events in the human nephrogenic niche, we performed 3D confocal imaging on millimeter-thick cortical slices from kidney specimens ranging from week 11 to week 23. Slices were immunostained to visualize SIX1, a marker of nephron progenitors in the human kidney28; PHH3, a marker of cells entering mitosis48; and KRT8, highlighting the ureteric epithelial tree and distal nephron–forming structures. Human samples were compared with E15.5 and P2 mouse kidney samples to examine cross-species differences and similarities. Videos displaying the 3D architecture are included (Supplemental Material). From week 11, the earliest stage we were able to analyze with this approach, approximately 1464 (SEM±157) SIX1+ nephron progenitors capped each branch tip (Figure 7, A and G). The progenitor-to-tip ratio progressively decreased to 486 (SEM±38) at week 15 (Figure 7, B, C, and G), then remained fairly constant (only a 15% drop) to week 17 (Figure 7, C–E and G). Thereafter, the progenitor tip ratio declined to 292 (SEM±27) at week 18 and 240 (SEM±14) by week 23 (Figure 7, F and G). 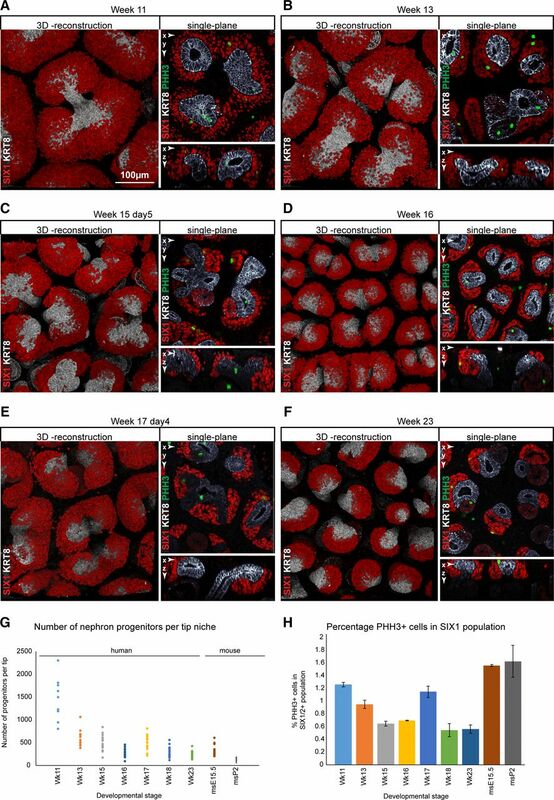 Examining mitotic frequencies showed a decrease in the number of PHH3+ cells within the SIX1+ population over time, from approximately 1.3% at week 11 to approximately 0.5% at week 23 (Figure 7H), suggesting that decreased nephron progenitor proliferation and enhanced nephrogenesis contribute to a decrease in progenitor numbers in the nephrogenic niche. In contrast, the percentage of PHH3+ cells in the mouse nephrogenic niche was similar at E15.5 and P2, consistent with published studies.34 Of note, the morphology and PHH3+ cell levels for the week 17 specimen more closely resembled a younger week 15 kidney. This observation may reflect normal sample variability in the population or some uncharacterized developmental anomaly retarding development of this kidney specimen. 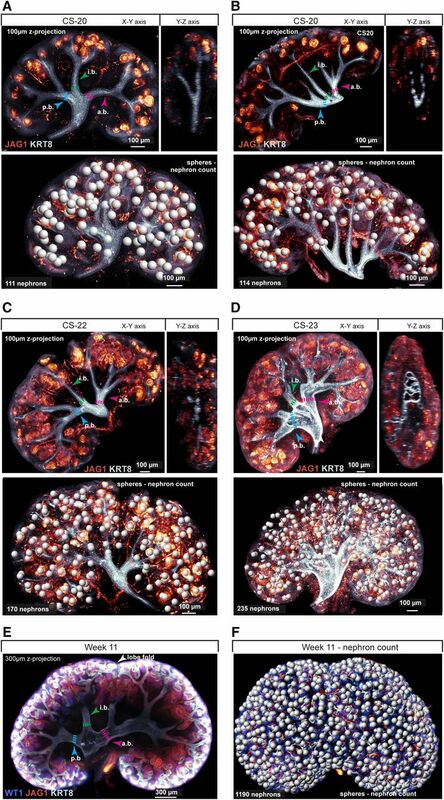 The changes in nephron progenitor number/branch tip occurred alongside changes in the morphologies of both the branch tips and progenitor pool. At week 11, nephron progenitors cap large, bulbous tips (Figure 7A, Supplemental Figure 3A). As the nephron progenitor population decreased during development, progenitors tightly packed around ureteric epithelial tips, shifting to the side of the tip (Figure 7, A–F) while tips narrowed in diameter as the kidney developed. At week 23 ureteric tips pointed upwards with no sign of bifurcations. The cap-tip architecture in the week 11 human kidney most closely resembled the E15.5 mouse kidney, with a relatively large NPC population loosely positioned above the tips (Supplemental Figure 3B); whereas, the week 23 kidneys were more similar to the later P2 mouse kidney, with a small, tightly packed NPC population mainly displaced to the side of tips. The distribution of ureteric epithelial tips across the kidney surface also changed during kidney development. Tip-to-tip distance decreased by 27% from week 11 (106 µm±SEM 1.6 µm) to week 23 (77 µm±SEM 0.7 µm) (Figure 8, A–C). Macroscopically, the distribution of tips and their nephron progenitor populations across the kidney surface displayed a rosette-like pattern of circular, radially symmetrically distributed tips; this was particularly evident at later stages, for example, at week 23. The center of the radial symmetry reflects a shared branching lineage for each cluster. Each cluster contained 2–3 tips at week 11 (Figure 8, D and E) and 5–8 tips at week 23. Interestingly, nephron progenitor cells were primarily positioned on the outward-facing surfaces of each branch tip within a cluster (Figure 8, G and H). Three-dimensional characterization of the human nephrogenic compartment shows complex arrangements of tips and niches. Whole-mount immunofluorescent stains for SIX1 and KRT8 in week 11 to week 23 kidneys and quantitative analyses. (A, B, D, and E) Images displaying lower magnification overview of changes to the tip niche morphologies. Green spheres indicate individual terminal points of tips which were measured to analyze tip-to–nearest-tip distances. (C and F) Quantitative analysis of distances between tips and number of “tips-per-niche” during development. Colored areas in (D and E) highlight individual clusters of niches and the numbers indicate tips per cluster. (G and H) Schematic showing the top-view architecture of the rosettes and the side-view distribution of tips, niches, nascent nephrons, and mature nephrons (arcading not shown). ms, mouse. To generate an overview of the gene-expression landscape during human kidney development we collected RNA from whole kidneys at five developmental stages: weeks 9, 11, 13, 17, and 21, and performed RNA-seq profiling on each sample (GEO accession numbers: GSE100859). To validate these data and determine whether genes associated with mature kidney functions could be identified, we first compared the first- and the last-stage kidneys: weeks 9 and 21. Overall gene expression was closely correlated between these samples (R value of 0.96; Figure 9A), although 170 genes were relatively enriched at week 9 whereas 247 genes were enriched at week 21 (Figure 9B, Supplemental Table 1; enrichment defined as two-fold higher expression at either stage). 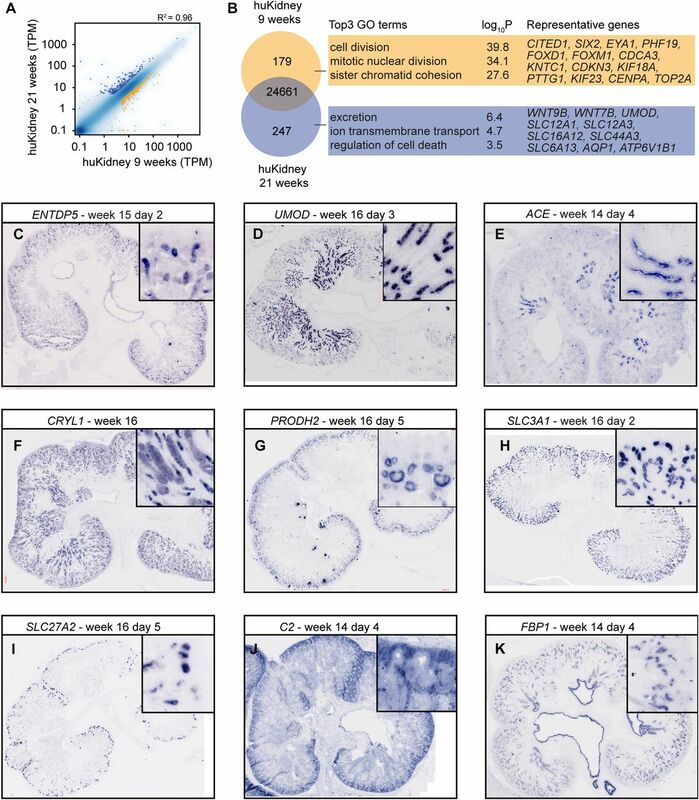 GO-term analyses highlighted cell proliferation terms in the 9-week kidneys and excretion and ion transport in the week 21 kidney, consistent with functional maturation over the 12-week developmental period (Supplemental Table 1). Multiple genes associated with nephron progenitors, interstitial progenitors, or cell proliferation were among the 170 genes enriched at week 9. Conversely, genes associated with the medullary region and nephron functionality, for example, solute carriers and transmembrane transport proteins, were identified within the 247 genes enriched at week 21. Identification of genes differentially expressed during maturation of human embryonic kidney. (A) Gene-level correlation of normalized mRNA-seq reads between week 9 human kidney samples and week 21 human kidney samples. (B) (Left) Number of differentially expressed genes between week 9 human kidney samples and week 21 human kidney samples. (Middle) Results of gene ontology (GO) term enrichment analysis of the indicated gene sets, with representative ones (right) from each set of genes. (C–K) Expression of genes defined as anchor genes in the mouse. Human samples range in age from week 14 day 4 to week 16 day 3. Expression and age as defined on the fields. Square inserts show magnified representative regions of nephron segments and kidney compartments that were labeled. huKidney, human kidney; TPM, Transcripts Per Kilobase Million. We also performed a step-wise comparative analysis for each developmental stage against the preceding and subsequent time-point (Supplemental Tables 2 and 3). The first time-point indicating a physiologic change was week 17: a comparison of week 17 with week 13 RNA-seq generated enriched GO terms for “Excretion,” with the detection of multiple genes associated with a more mature nephron or collecting duct type; genes included: CLCNKA, CLCNKB, UMOD, AQP6, SCNN1G, SCNN1B, ATP6V1B1, ATP6V0A4, AQP3, KCNJ1, and AQP2 (Supplemental Table 2). In summary, the broad transcriptional profiles are a rich dataset providing information that will be especially useful in assessing in vitro efforts to generate kidney-like structures. Our data indicate that no mature nephrons are present at 8–9 weeks of development (Figure 2E); however, this is the point when human kidneys have been described to become functional, as inferred from their contribution to the amniotic fluid volume.49 To examine when cell types associated with mature nephron identities emerge during human kidney development and to assess the degree of conservation between species, we undertook multiple approaches. First, we performed high-resolution section in situ hybridizations (SISH) for 26 genes known to be expressed within the nephron lineage; so-called “anchor genes” from an earlier appraisal to identify a minimum set of nonredundant molecular markers for key cell types in the developing and adult mouse kidney.50 Second, we analyzed the RNA from our whole-kidney RNA profiles by comparing these data to existing RNA expression profiles from specific segments of the adult rat nephron. Third, we assembled a collection of 14 antibodies that recognize epitopes of proteins that are known to be present in specific nephron segments in the mouse and performed immunofluorescent analyses on cryo-sectioned kidneys from specimens ranging from week 8 to week 16. GUDMAP studies identified a list of 32 anchor genes on the basis of their specificity in demarcating distinct cell types in the mouse nephron and not elsewhere in the kidney.50,51 To determine when mature cell types emerge and whether mouse anchor genes are equivalently expressed in the human kidney, we performed SISH to visualize expression of the human counterpart of 26 of these genes; no human genes equivalent could be identified or sequence amplified for the other six (AI317395, BC089597, Cml1, Ugt2b37, Fam129a, and C230096N06). SISH was performed on >9 sections per probe on samples originating from specimens aged 9–17 weeks of development. The SISH experiments were carried out on both cryo-sectioned and wax-sectioned specimens. Twenty of the 26 genes were detected in the human kidney (Figure 9, C–K, Table 2). Only three (11%) genes displayed a directly comparable expression between mouse and human kidneys: SLC22A6, ENTPD5, and UMOD (Figure 9, C and D, Table 2; and data not shown). Six genes (23%) recapitulated the mouse expression domain but displayed additional expression not documented in the mouse, whereas 11 (42%) where expressed in what is likely a different cell population and six (23%) where not detected in the human SISH kidney studies. Data highlighting distinct expression domains for ACE, CRYL1, PRODH2, SLC3A1, SLC27A2, C2, and FBP1 are presented in (Figure 9, E–K), and data for all anchor genes are summarized in Table 2. As examples, FBP1 and C2 demarcate proximal tubule (PT) domains in the mouse kidney: FBP1 was expressed in human PT, but also more broadly within the renal pelvis and renal calyces and the loop of Henle (Figure 9K), whereas C2 was absent from the PT but expressed strongly in both nephron and interstitial progenitor compartments (Figure 9J). Genes that were not detected by SISH (FMO2, MOGAT2, SLC18A1, SLC6A20, SPP2, and NPY) showed low or undetectable transcript levels in the week 9 to week 21 whole-kidney RNA-seq data, consistent with the negative SISH result. Analysis of individual National Center for Biotechnology Information adult gene tissue summaries suggests none of these genes are strongly expressed in adult kidney (RPKM values of 5 or less). To extend rodent and human comparisons, we compared nephron segment RNA profiles from the rat and our human kidney RNA-seq data, analyzing expression of 56 genes highlighted in the rat nephron for distinct expression within specific rat nephron segments.52 Whole expression profiles are included in Supplemental Table 3. Over the week 9 to week 21 period, the proportions of different cell types change in the kidney19,22,23 and it is therefore challenging to directly deduce the emergence of mature cell types from whole-tissue RNA samples. However, the expectation would be that mature cell types of the various segments of the adult nephron remain rare at week 9, increasing with developmental age, with a concomitant increase in the expression of genes associated with each cell type. We arrange the 56 genes into their respective expression domains (Supplemental Figure 4) as previously described for the rat.52 Genes specific to the renal corpuscle, such as NPHS2, PODXL, MAFB, SYNPO, and NPHS1, increased moderately and gradually over time. Genes expressed in S2–S3 segments of the PT (PTH1R and HNF4A) increased strongly from week 9 to week 11 and gradually thereafter. SPP1 and S100A6, marker genes for the proximal portions of the loop of Henle, increased robustly and consistently over time. CLU, UMOD, and SLC12A1, expressed in the distal portion of the loop of Henle; DEFB1, expressed in distal convoluted tubule and connecting segment; and AQP2, expressed in the collecting duct, were all strongly upregulated after week 13, increasing to week 21. The data are consistent with the presence of renal corpuscles by week 11 that increase with other mature segments developing by week 11. Interestingly, many genes did not follow a coordinated behavior (e.g., PTERG3 and MAP3K7) or increase over development as expected. The low level of conserved gene expression (11%), as established for the mouse anchor genes, raises the possibility that expression of several of the rat segmental marker genes may not be conserved in the developing human kidney. To improve the resolution, we performed antibody staining on kidneys from week 8 through to week 11 and compared expression patterns against E18.5 mouse kidneys, where immature and functional nephrons are abundant. Podocytes were labeled with MAFB and NPHS2 antibodies. To detect PT cells immunolabeling was performed against LRP2 and CUBN,53 and FITC-conjugated Lotus tetragonolobus lectin (LTL) was also used to label PT brush borders.54 Distal tubules were detected using antibodies for SLC12A1 and SLC12A3, whereas the ascending limb of the loop of Henle was detected using antibodies for SLC12A1 and UMOD.55–57 The collecting duct was labeled using KRT8, AQP2, and CALB1; KRT8 also demarcates the distal tubule. Vascular components within the renal corpuscle were labeled by VEGFR2. The distribution of these patterning markers is highlighted in Figure 10A. Kidneys from weeks 8, 10, and 11 embryos and fetuses immunostained for nephron markers indicate when mature cell types develop in the human kidney. (A) Table indicating the expected detection pattern for proteins used in figure. (B–F) Week 8. (G and H) Week 10 day 3. (I) Week 11 day 4. The antibody stains and structures are as indicated on fields. Scale bar is 50 µm. CD, collecting duct; DT, distal tubule; LOH, loop of Henle; RC, renal corpuscle. AQP2+, CALB1+, and KRT8+ collecting duct tubules (Figure 10, B and C) and rare CUBN+, LTL+, and LRP2+ PTs (Figure 10, B, D, and E) were observed in the week 8 human kidney. Similarly, some morphologically immature MAFB+, VEGFR2+, and NPHS2+ renal corpuscles were also present (Figure 10, C, E, and F). KRT8/18, specific to the mouse collecting duct, was also widely expressed in both the distal and proximal portions of nephrons (Figure 10, B–D and F). Ascending loop of Henle markers SLC12A1 and UMOD were absent until week 10 (Figure 10, G and H), and the distal tubule marker SLC12A3 until 11 (Figure 10I). Although the locations of CUBN, AQP2, and LRP2 were as expected from mouse studies, UMOD and SLC12A1 showed a reduction in their overlapping domain in the human kidney versus mouse nephron (Figure 10H, Supplemental Figure 5C). Unlike the mouse, where Calb1 is strongly detected in both the collecting duct and the connecting tubule (Supplemental Figure 5A), we did not detect human CALB1 in nephrons at these time-points. 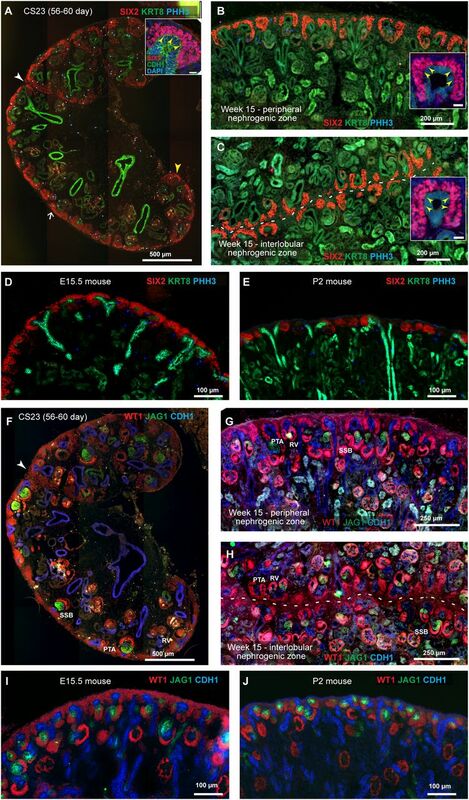 In this study, we examined human kidney organogenesis in a large number of embryonic and fetal kidneys ranging from week 5 through to week 23, using immunohistochemistry, histology, three-dimensional modeling, and RNA profiling. Macroanatomic features are conserved in the human and mouse, albeit with distinct organization and temporal dynamics and differences in associated gene expression. We discuss these findings, contrasting human and mouse development, with a particular focus toward informing in vitro efforts to model human kidney development. Progression to SSB nephrons takes <24 hours in the mouse kidney and in primary mouse nephron progenitor cells the process takes <48 hours when induced in vitro.58 Following the progression of the first set of nephrons in the human kidney indicates nephrogenesis commences at CS16 with SSB formation at CS18–CS19, somewhat earlier than Potter23 described. This provides an estimate of around 8 days for the transition to SSBs. The slower time course of the nephrogenic program is consistent with mouse and human comparisons in other organ systems, although the regulatory mechanisms determining the “pace of development” across mammalian species are not understood. In the mouse, activity of Hox11 paralogs specifically demarcates the metanephric kidney anlagen and their combined action is essential for metanephric kidney development.61,62 Although there is strong evidence that Hox-boundaries correlate with morphologic conservation across species, the anterior extent of Hox11 expression has not been determined in the human embryo. Analysis of our RNA-seq data herein confirms the expression of HOX10/11 paralogs and absence of HOX12/13 paralogs in human kidney samples as expected from mouse studies (Supplemental Table 4). Hox11 activity in in vitro kidney organoids appears to vary depending on the protocol. Reanalysis of RNA-seq data from human kidney organoids profiled by Takasato et al.12 shows no evidence of significant HOX11 paralog activity, although transcripts for HOX10 paralogs, and other HOX-members, are present within the dataset (see Supplemental Table 3). In contrast, immunostaining supports HOXD11 paralog activity within organoids developed by Takasato et al.12 and Morizane et al.63 In vitro studies will benefit from a more detailed molecular and cellular analysis of how kidney-like structures form. We observed the appearance of a pseudo-stratified ureteric epithelium branch tip during stages CS16–CS19. Potter,23 likewise, described a multilayered organization but concluded this to be an artifact of the high cell density and crowding of cells. However, the appearance of this structure in multiple early specimens and the disappearance at later stages suggest this is a real structural feature of the outgrowing epithelium of the human, but not the mouse, ureteric bud. Multilayered branching epithelia have been reported in the mammary gland and other branching systems.64 After budding, the mouse ureteric bud bifurcates (or more rarely trifurcates); there then follows an extensive period of bifurcation.34,46 In the whole-mount analyses of human kidney specimens (CS20, week 11; Figure 6), interdomain branches do not obviously originate from either the anterior or posterior domain branches. The increased cellularity of the outgrowing human ureteric bud might facilitate the formation of interdomain branching shortly after anterior and posterior domain branches form from the first bifurcation of the ureteric bud tip. The mechanisms driving kidney lobulation and the physiologic purpose of this process are unknown. It has been suggested that lobulation correlates with increased organism body size but exceptions to this are common.19 We detected the first sign of lobulation at CS19, when a subset of mesenchymal cells within the kidney align along the radial axis of the kidney forming striated cell clusters between the anterior and posterior domains of the kidney (arrowed in Figure 2C). The striated cells, presumably of an interstitial cell origin, presage the physical separation of lobes and may therefore play a role in the formation of lobes, although addressing their function, or the triggers for their formation (local signaling and/or mechanical stresses), will be difficult to determine. After the appearance of striations, surface indentations were observed, and then actual lobes became evident anteriorly, in close proximity to the adrenal gland. Interestingly, at the level of our analysis, nephrogenic niches within interlobular or peripheral regions of the cortex were indistinguishable. In the human kidney, we observe maturing glomeruli at an early stage of collecting duct development resembling the E12.5–E13.5 mouse kidney, 2–3 days before active functional glomeruli are present in the mouse. Previous studies have suggested human kidneys start to contribute to amniotic fluid volume at this time.49 Further, our immunofluorescence analyses also show vascularized renal corpuscles (Figure 10) connected to PTs displaying several physiologically important proteins, e.g., CUBN and LRP2. In contrast, loop of Henle marker activity, including UMOD and SLC12A1, emerged at week 10, and only at around week 11 could distal tubule marker SLC12A3 be observed (Figures 3 and 10). This suggests glomerular filtration may be occurring at CS23, but it is likely considerably later in human kidney development that the organ adopts a more mature functional activity. We observed that the 3D architecture and composition of human and mouse nephrogenic niches followed a similar developmental progression in their reduction of progenitor endowment but proceeded at different time-scales. The developmental range we described in 3D for the human occurred over approximately 80 days (11 weeks), and what we consider a comparative developmental progression occurred in the mouse within 9 days (E12.5–P2). Although we observed macroscopic similarities in the anatomy of the nephrogenic niche, absolute numbers of cellular components as well as absolute distance among anatomic structures varied across species. The number of nephron progenitors per human tip, the number of human ureteric epithelial tips, as well as distance between tips, are of a different order in the human kidney. Further, the formation of rosette-like clusters of ureteric tips (Figure 8, G and H), where nephrogenic niches face outwards, away from the center, is a distinct human feature. Given the placement of progenitors, nephron formation occurs radially around branch clusters. What accounts for this asymmetry is unclear. 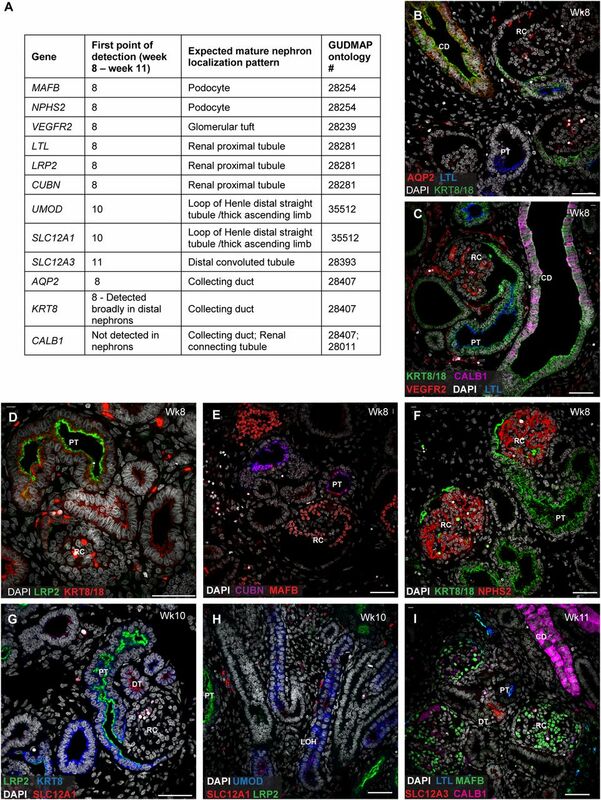 A priority of the GUDMAP initiative has been to identify robust sets of genes to unambiguously identify discrete structures in the mouse kidney, so-called anchor genes.50 Evaluation of human PSC- and NPC-derived kidney-like structures in kidney organoids has leant heavily on these genes to interpret in vitro nephrogenesis. Surprisingly, only three of 26 anchor genes conserved what appeared to be a “mouse-like” expression pattern in the human kidney. Some prominent mouse-expressed genes like Spp2,50 which encodes a secreted phosphoprotein that binds members of the Tgf-β superfamily69 and is a specific product of a subregion of the mouse PT segment, are likely completely absent from the human kidney. This raises the question of how Spp2 modifies kidney form, function, or physiology across species. Clearly, these differences stress the need for developing strong criteria for scoring cell diversity and identifying minimal sets of cell-type identifiers most appropriate to assess human renal kidney cell types and renal activity. This is especially important given the clinical relevance of several of these genes. For example, SLC3A1 mutations are linked to cysteinuria70 and FBP1 mutations to clear cell renal cell carcinoma.71 These findings also affect interpretation of human kidney organoid development and the investment into gene reporter–driven efforts to identify and isolate critical cell types from these in vitro model systems. As examples, GATA3 and KRT8/18 have both been used to identify ureteric epithelial derivatives in several reports of human kidney organoids.12 However, in contrast to the mouse, both proteins extend from the ureteric epithelium into the distal nephron tubule, indicating that neither protein is a specific marker for the ureteric epithelial lineage (Figure 10; and data not shown). Complete methods are included as Supplemental Information. Consented, anonymized, human fetal tissue was obtained from elective terminations following review of the study by the Keck School of Medicine of the University of Southern California’s Institutional Review Board. Kidney samples ranging in age from 4 to 23 weeks of gestation were supplied by collaborators at the Children’s Hospital of Los Angeles, the University of California, San Francisco, or the Wellcome-funded Human Developmental Biology Resource center at the Institute of Genetic Medicine, Newcastle Upon Tyne, United Kingdom, and the Institute of Child Health, London, United Kingdom. Gestational age was determined per guidelines specified by the American College of Obstetricians and Gynecologists using ultrasound, heel-to-toe, and crown-to-rump measurements following published CSs.35–37 Stages indicate the age of the embryo or fetus from the point of conception/fertilization. Samples from the Children’s Hospital of Los Angeles were received immediately after elective terminations and transported on ice at 4°C in 10% FBS, 25 mM Hepes, high-glucose DMEM (SIGMA). Samples from the University of California, San Francisco, were transported similarly by overnight courier. Samples from the Human Developmental Biology Resource center were supplied as whole tissues fixed in 4% formaldehyde and shipped in PBS, or as paraffin sections or whole tissue embedded in paraffin. Given the anonymized nature of the specimens, no further information was available regarding the specimens or the normalcy of the pregnancy. We thank all members of the McMahon lab for helpful discussions. We thank Dr. Jamie Davies (University of Edinburgh) and Dr. Qais Al-Awqati (Columbia University) for pointing out and providing copies of work by Peter, Oliver, and Reinhoff. We thank Dr. Rachel Steward and Dr. Melissa Wilson for their help providing tissue samples and Institutional Review Board approval processes. Human embryonic and fetal material was provided by the Joint Medical Research Council/Wellcome Trust (grant # 099175/Z/12/Z) Human Developmental Biology Resource (www.hdbr.org). We thank Dr. Cathy Mendelsohn (Columbia University) for histology samples. Work in A.P.M.’s laboratory was supported by grants from the National Institutes of Health (NIH) (DK107350, DK094526, DK110792) and the California Institute for Regenerative Medicine (LA1-06536). E.R. was supported by the National Institute of Diabetes and Digestive and Kidney Diseases Award (F31DK107216). A.D.K. was supported by the NIH (5F32DK109616-02) and the University of Southern California (USC) Stem Cell postdoctoral fellowship from the Hearst Foundation. Q.G. was supported by the USC Research Enhancement Fellowship. N.O.L., J.G., T.T., Q.G., J.A.M., and A.P.M. planned experiments and analyzed data. N.O.L., Q.G., T.T., and J.A.M. assembled the figures.N.O.L., J.A.M., J.G., R.K.P., E.R., C.L., and G.S. collected data. B.G. and L.B. provided embryonic and fetal kidneys. R.E.S. and C.K. built the image visualization tools for human data at GUDMAP.org. N.O.L. and A.P.M. wrote the manuscript, incorporating input from all authors. N.O.L. and J.A.M. contributed equally to this work. This article contains supplemental material online at http://jasn.asnjournals.org/lookup/suppl/doi:10.1681/ASN.2017080887/-/DCSupplemental.